Poppy seed tea contains different opiates in various concentrations. Typically Morphine and Codeine are the main ones. Morphine is recognized as one of the most (if not the most) addictive substances known to man and is, for this reason, also one of the most tightly controlled. Overdoses of Morphine can be lethal. The main cause of death for Morphine overdose is pulmonary edema, where the lungs fill with fluid passed from the blood stream through the alveoli in the lungs. The Morphine content in poppy seeds can vary enormously depending on many factors: the exact type of seeds, the harvesting time (even seeds picked a few weeks apart), and others. Poppy seeds sold in bulk in supermarkets are not controlled for the amount of opiates in them, but rather for their flavor and appearance, as they are meant to be used for baking. When you make an infusion from these seeds, there is no telling how much opiates your solution will contain. You are truly playing a potentially deadly game of Russian roulette. He had taken poppy seed tea several times, always using the exact same amount of seeds and same preparation. The last time he took it, it resulted in his death due to Morphine overdose. The autopsy revealed a Morphine concentration in his blood and urine that was SIX TIMES the lethal levels. The coroner's lab also analyzed an infusion of poppy seeds prepared with the same batch of seeds and confirmed that the concentrations of Codeine and Morphine was extremely high and matched the percentages detected in the autopsy. This ruled out the possibility of Morphine also having come from an additional source other than the tea (pills or injection). How could this happen? Clearly, the supermarket had received a new and different batch of seeds, with significantly higher Morphine content in them. PLEASE BE VERY CAREFUL WITH POPPY SEED TEA! You can never know how much Morphine it will contain. When, as parents, we realized that our son was taking poppy seed tea, we saw it as a "natural herbal tea", prepared with an ingredient sold openly in supermarkets without any restrictions, and thought that it was acceptable for him to do this. When we looked on the Internet for additional information on it, we did find several sites that talked about it, but none stated clearly that this tea contained morphine and that these levels could potentially be lethal. 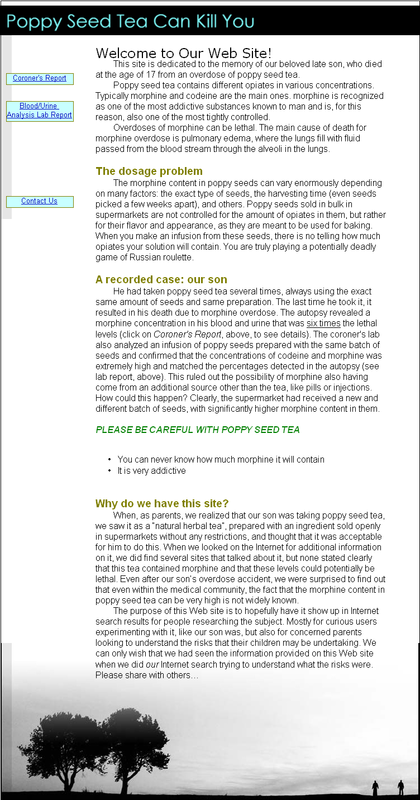 Even after our son’s overdose accident, we were surprised to find out that even within the medical community, the fact that the morphine content in poppy seed tea can be lethally high is not widely known.